When you need convenient maneuverability around a worksite,  Pioneer  Offroad  Rentals offers ‘Honda reliability’ in the form of the Honda Foreman  500cc. 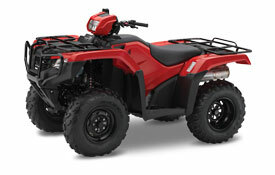 This extremely versatile, durable, and user-friendly ATV are  ideal  for  offroad  trips requiring minimal cargo capacity but maximum capability  to move through any terrain. Your Honda Foreman rental comes equipped with a 3000 lb winch for towing, a trailer hitch, and a 12 V plug in. Dimensions L: 84.5" H: 48.6" W: 47.4"